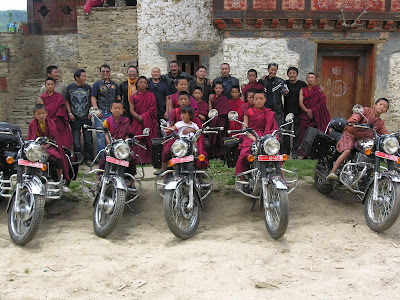 This is the fifth ride the Bhutan Dragons Motorcycle Club has made since the club was initiated last October. I was there for the inaugural ride; a sunny trip to Paro atop a steep hill where a monastery stood not knowing what kind of visitors they were going to get. It definitely was not the conventional kind as a motley crew of leather clad motorcyclists roared up to the temple grounds and in a very Bhutanese fashion, mixed modernism with tradition. That sunny day the club brought feather-jackets for the young monks in residence. This spun in motion an adventure that has since roared and wheeled the long and winding roads of Bhutan to destinations both near and afar- with aspirations to lend a little helping hand and have fun doing it. The second openhanded ride was to the tropical climes of Gelephu. I could not make that trip; bogged down with my own existential-dilemmas! All I could promise my disappointed mates was that I’d do the stories: As Pale Rider so aptly put it in his email to me the other day, “To brother who seldom rides but often writes!” So I got the details of what they’d gone through on this, the club’s latest ride to Ura in Bumthang. I saw the pictures and went through the salient points Pale Rider had noted so neatly. Across me, Cool Rider was still recovering from the long trip. He filled me in on the factual details and anecdotes. He said Lone Rider (a member who had come for the ride from Darjeeling) continued cruising through the Express Way and oblivious to his fellow-riders, kept riding toward Chhunzom. They had to pull-over and await the man minus the road-map. Lone Rider was back with the pack after a good-thirty-minute detour. Cool Rider enjoyed this story-telling-dictating delirium! How the torrential downpours had them all drenched and chilled as they rode through a foggy Pelela and the vast and surreal vista that awaits you as you climb up the middle-mountains and get on to the flatlands of Geytsa in Bumthang. The picture slides showed my fellow-dragons roughing it out with nature and spending the nights in sleeping bags and tents. The pictures in the open camps got to me, “Bullocks! I’ve got to stop missing these rides!” I find myself in consolation-mode. During the second ride to Gelephu, it was yet another monastery the club chose as its recipient. 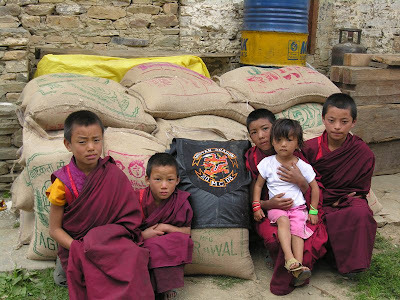 The young monks in residence were given blankets, sandals and other bare necessities. The third ride took them to Haa- no laughing matter as they rode to yet another monastery and made whatever contributions they could afford. Now country-folks await these steel-horse-riders, I suspect. The fourth ride was to Zhemgang. It was triggered by a story in Kuensel about a little girl who was the victim of an alcoholic father and a mother who’s been so badly battered by the husband she’s in need of dire professional help. The club’s intention to bring the young girl and sponsor her education was complicated by her insistence on having her mother with her. The mother would not accept the offer if her old mother did not accompany them. So instead of bringing the little girl, the club landed up bringing the whole family to Paro (in the club’s motorcycle-utility-van). The family has been housed-in comfortably and the little girl goes to school. Club members make voluntary contributions for the family’s upkeep. The club’s president, Ghost Rider, looks after the family most of the time. But the mother is clearly in need of a professional psychological/psychiatric help and guidance. A bunch of bikers with good intentions can only do so much. The club has been considering approaching two-NGOs- REWA or RENEW to seek a helping hand. This well-intended ride was probably the hardest in terms of circumstance but the feeling among members is one of optimism; hopeful the good intentions will not crash. The ride to Ura in Bumthang was the same as the rest; a combination of philanthropy and plain good-old fashioned-no-holds-barred ride with the elements. Sometimes against the elements, such as monsoon downpours and summer scorches. They rode to the monastery of Gaden, a family-monastery administered by a Lam who is paralyzed in the legs (from a vehicular accident). The monastery has 24 monks in residence and our steel-riders had all brought a year’s supply of rice. Cool Rider continued on with the chronicles as the slides showed splendid scenarios. There was Ghost Rider, Silver Rider, Old Rider, Khampa Rider (aka Lone Rider), Khan Rider, Don Rider, Dark Rider, Ex Rider, Scribe Rider and Cool Rider himself; carrying those sacks of rice to the temple. Sitting across me and lost somewhere in his own story, Cool Rider held his right shoulder and let out a groan. He said he’d tried clean-jerking the sack of rice on to his shoulder. He’d forgotten the three-plus decades we’ve been around!